One of the most convenient ways of preparing laminate for a new flooring project is by using a laminate cutter. They are a clean, easy to use and very affordable. 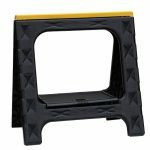 So what is the best laminate cutter on the market today? As with all good tools there’s a wide range available. To help you we have pulled together this top 5 review round up. For our findings at a glance just turn to the table below. For full reviews of each of our top 5 picks, plus a dedicated laminate cutter buyer’s guide, keep on reading. Having the right tool for the job is more than half the battle. This goes for any DIY project, especially when it comes to laying a new floor. There are a number of ways you can go about cutting laminate floor pieces to the correct size for your project, however the best way to cut laminate flooring is with a good old cutter. Nothing is as clean and hassle free. The fact is, laminate is a man made material. It is constructed using glues and resins that will destroy the edges of normal blades. This is why you need a cutter specifically designed to tolerate the material. The laminate cutter blade will stay sharp for longer. Furthermore, these tools are easy to use. Just line up your laminate and pull down on the handle. This results in a clean finish, both on the edges of your material (no burr marks or splinters) as well as the work space; when compared to using a saw there’s a lot less dust flying about. Why not use a Miter or Chop Saw instead? There is a middle ground option however, for those that prefer the process of using a saw instead of a cutter. 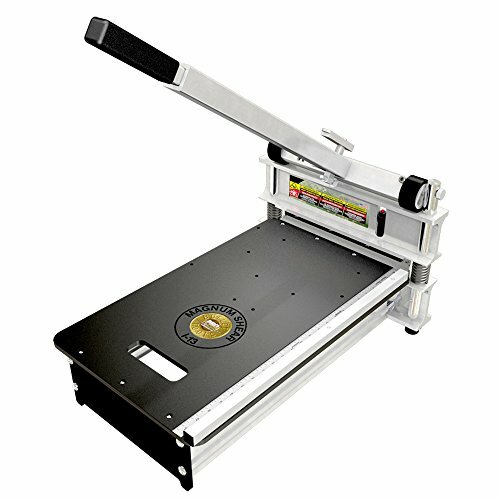 One laminate cutter to make our top 5 list (the SKIL 3601-02) actually uses a saw mechanism to cut the material. This makes a suitable alternative to taking the plunge and buying a miter or chop saw as the latter are generally a lot more expensive. 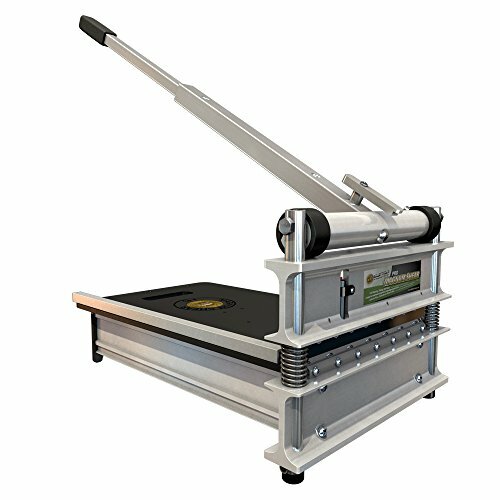 There are a range of laminate cutter sizes available. Anything with a cutting capacity of 9 inches or more should do the trick. 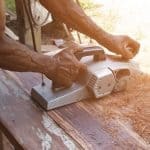 If you know the type of project you are doing in advance, (or will be doing on a regular basis if you are a professional) you can buy the correct sized cutter for you. Tradesman will often need the versatility of a larger model, however portability should also be considered. When looking into blade type and material, the best blade to cut laminate flooring is high carbon steel. Blades should also be easily replaceable as this will extend the shelf life of your tool. The quality of the construction is tied closely to that of budget. The more premium model laminate cutters will generally be made from higher quality and more durable components. Brand reputation will also play a part here. Brands such as Robert’s and Bullet Tools have been in the cutter space for some time. They have released a number of products and have had opportunity to fine tune their designs to meet the demands of the consumer. This is often reflected in the price however. 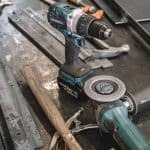 Weight and storage solutions, whether the tool shipped fully constructed or has to be pieced together upon arrival – these are all issues you should consider before you buy. Angled cutting is another feature worth considering, especially for professional floorers. Budget models will rarely have this option however. Warranty duration is another factor. Although it shouldn’t be a deal breaker, a generous long term warranty (backed up with good reviews of customer service) is a nice back up to have should you encounter any problems. 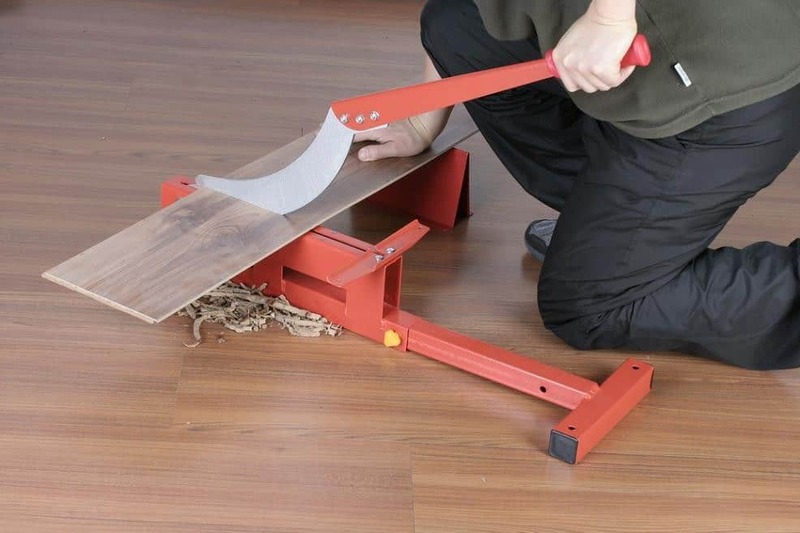 The Exchange-a-Blade cutter is our top pick for cutting laminate flooring. This tool offers precision cutting and is capable of slicing through widths as long as 9 inches. An extremely sharp blade prevents the splitting of boards and splintering of edges. It features an extra-long handle, providing users with maximum leverage and an effortless cutting action. This cutter measures 21 inches long, 10 inches wide and 3.5 inches in height, while weighing just 12 pounds, making it the lightest option by far. EAB Tools (the company behind Exchange A Blade) have opted for a blade made from a high carbon steel which ensures longevity and durability. This tool is suited to cutting engineered wood flooring, vinyl and PVC tiles, fiber cement or vinyl siding as well as pressboard lab siding. Replacement blades are also available for when it comes time to swap out your old blade. 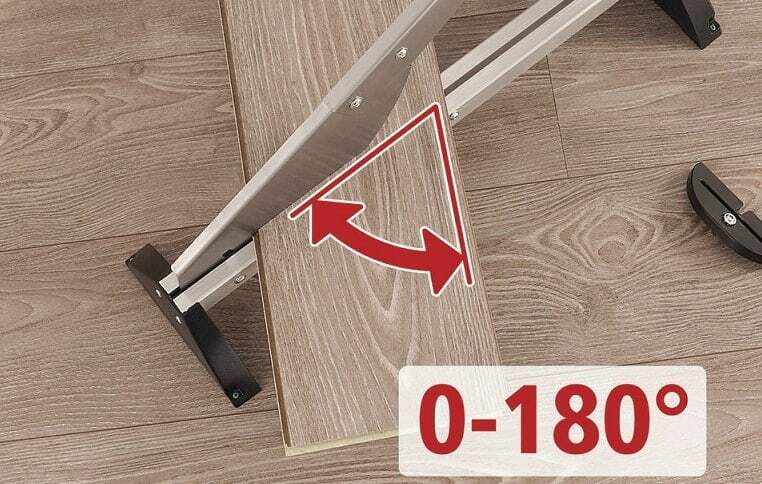 This flooring cutter also features an angle gauge, perfect for cutting precise angles so that you can get those corners and flooring patterns just right. The cutter is made of aluminum and steel, affording users a light-weight, portable and durable tool. Unlike larger, heavier cutters, the compact, lightweight design means you can easily take this floor cutter wherever it is needed most. This is the perfect option for a handyman who’s on the move and needs to take his trusty tools along with him. Reduces the amount of dust when cutting. Easy cutting in the room in which you are laying the flooring, this also saves time. Great for cutting thinner laminates. Standard protractor guide isn’t very stable or secure (use a larger washer beneath the knob to solve this). Will not perform every cut you may need to make on a complex job. Does require some strength to operate. 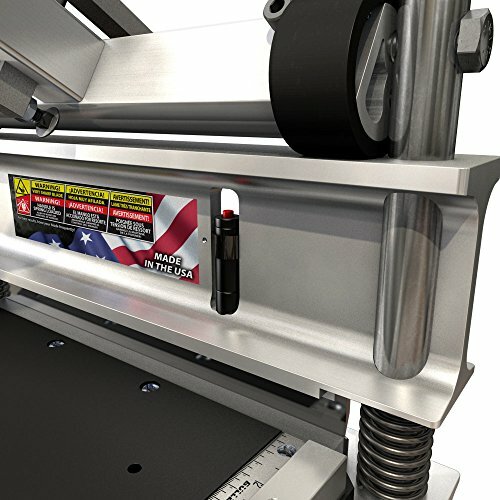 Can this machine cut 12mm laminated floors? Yes, it will cut 12mm thick flooring boards with ease. The handle does require some pressure but it will cut this thickness well throughout the entire job. Can this cut the horizontal and perpendicular length? No, this cutter will not be able to cut your boards horizontally but it is able to cut them to length, so long as they’re no more than 9” wide. 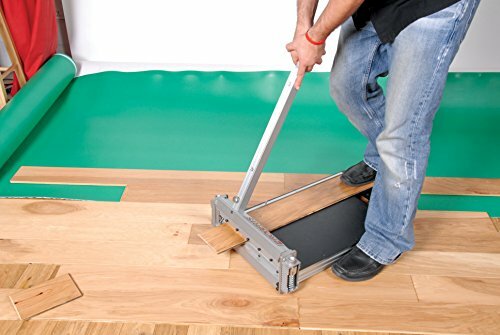 The Exchange-a-Blade 2100005 9-Inch Laminate Flooring Cutter is a brilliant time saver. The compact design means that you can move it into and operate it within the room in which you are laying flooring instead of moving back and forth from a table saw. This can halve the time involved in cutting. This is also a no-mess solution, reducing the amount of dust that would be involved if you were to use power tools such as a table or jigsaw. Make sure that the gauge is correct, you can easily modify it if you see fit. The cutting action does require some strength and may be too much of a chore for some. Overall, this is an excellent, compact cutter best suited to the time-conscious man on the move. In our opinion it is currently the best laminate flooring cutter you can buy. The Bullet Tools Sharpshooter is one of the mid-priced options on our list. This tool is made in the USA and backed by a generous 1-year warranty. The Sharpshooter is best suited to cutting siding and laminate flooring up to a width of 9 inches and a thickness of 5/8 inches. 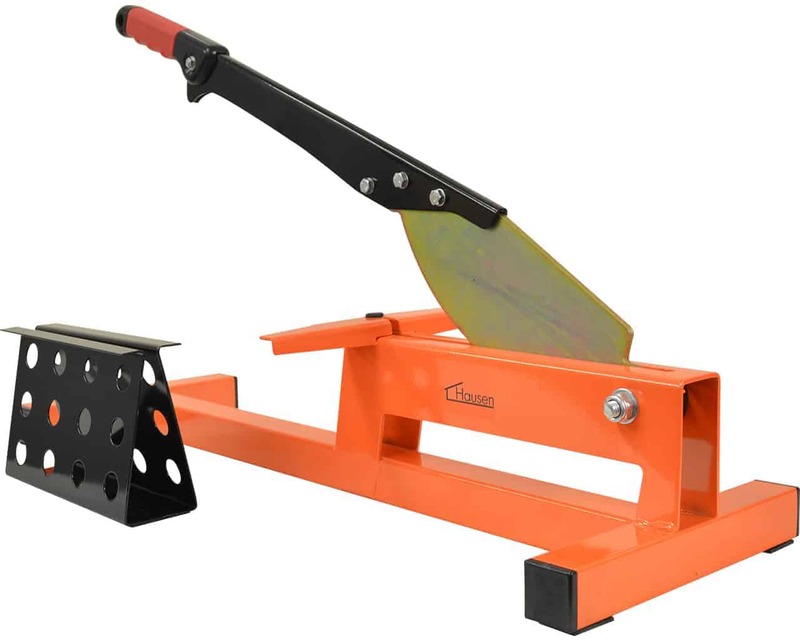 It features an extremely durable shear blade, capable of outlasting 20 or so normal saw blades. This also removes the hassle of electrical cords and drastically reduces the amount of dust produced when cutting your boards to size. This tool is 29 inches long, 12 inches wide and measures 18 inches high, it also weighs in at just 15.8 pounds, making it the 2nd lightest option on our list. 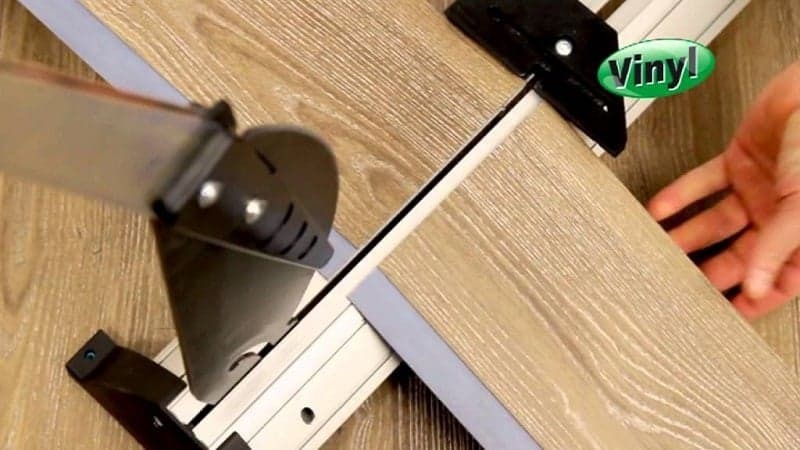 Bullet Tools have created a cutter that saves floorers a huge amount of time as the cutter can be placed within the room being floored, allowing maximum efficiency in terms of measuring, cutting and placing the flooring. This tool cuts laminate flooring, engineered wood, fiber cement siding, luxury vinyl as well as other similar types of products. Unlike the Exchange-a-Blade which has been said to be quite loud when cutting, the Bullet Tools Sharpshooter affords users a very quiet operation, allowing them to even work at night. Very quiet operation, adding hours to the day. Reduces the amount of dust produced with power tools, meaning less clean up time. No power cords needed, keeping your workspace neat and efficient. Save time by measuring and cutting in the same room. Designed for straight cuts only. The base is made of wood which can chip and become damaged over time. Will this cut thicker boards, such as those that are 10mm thick? Yes, the Bullet Tools 9” Sharpshooter will easily cut boards up to 12mm thick. Will this cut metal such as copper or brass? Yes, it will however this will dull the blade far faster than if you were cutting flooring boards. The Bullet Tools 9 inch EZ Shear Sharpshooter Siding and Laminate Flooring Cutter is a mid-priced option that is made in the United States. It affords users a very quiet and clean cutting experience. This tool provides a neat an efficient workspace. It is designed to perform straight rather than angled cuts and is one of the more expensive options. 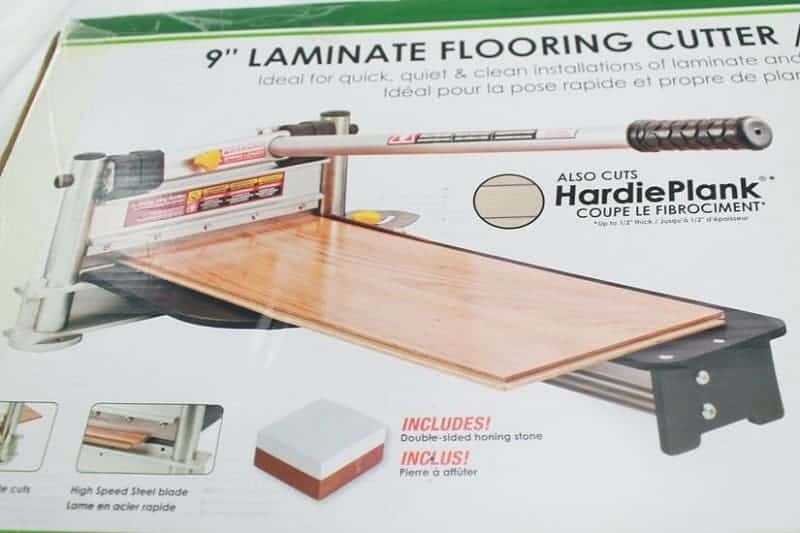 If you’re a neat freak looking to work on projects into the late hours of the night then this laminate floor cutter is the option for you. In this Roberts laminate cutter review we shall take a look at the 10-64 13 inch pro model, which at the time of writing is a more expensive flooring cutter than the two options above. This tool is best suited to cutting clean edges on vinyl siding and flooring, VCT tiles, engineered wood, laminate as well as rubber and foam tiles. Unlike the above-mentioned options, this guillotine-style cutter offers a generous cutting width of 13 inches and cutting thickness of 5/8 inches. The blade is replaceable and can easily be removed for sharpening. This cutter measures 24 inches in length, 15.5 inches wide and 3.8 inches in height while weighing in at just 23.8 pounds, making it one of the lightest options available. Roberts have opted an aluminum construction for its rigidity and light-weight properties, while the large cutting table is surfaced with plastic which helps stabilize longer planks and boards when cutting. The handle is extendable so that you can increase your leverage and effortlessly cut through all types of flooring. A fully-adjustable cutting guide is also provided, which you can swivel and lock down to cut a variety of different angles, provided the width of the board doesn’t exceed 13 inches. Cuts a variety of different flooring material types. Cuts boards or planks up to 13 inches in width. Cuts a multitude of accurate angles. Extendable handle for adjustable leverage. May chip the laminate surface. Best for home-owner use rather than professional use. Will this be able to cut fiber cement siding? Yes, but you will be sharpening the blade often. Luckily, this comes with a sharpening stone. What is the real difference between the 10-63 and the 10-64 models? The 64 is a pro grade while the 63 is more of a DIY tool. The 64 is far more sturdy and will last far longer. 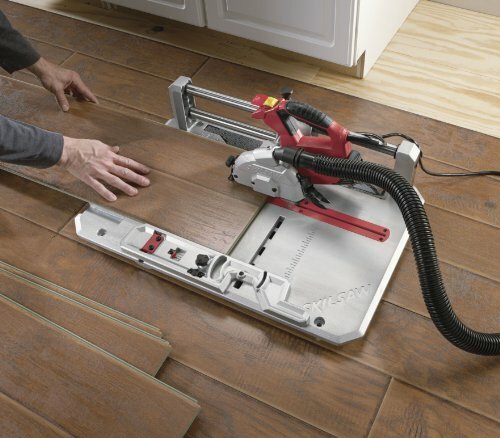 The Roberts 10-64 13-Inch Pro Flooring Cutter is a light-weight, versatile piece of equipment. The extendible arm makes for easy operation and the generous 13” blade means you can cut larger planks and boards. It is one of the more expensive options yet isn’t perfectly suited to long-term professional use. 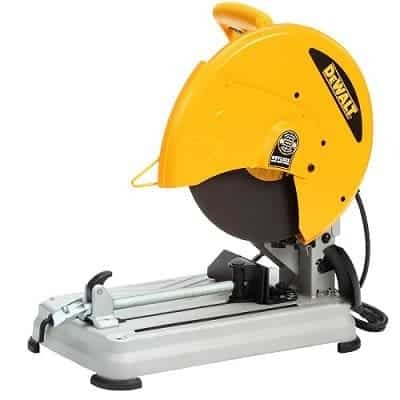 That being said, if you’re a DIY home user looking for a tool capable of cutting widths larger than 9 inches as well as angles, then this is the option for you. The Skil Flooring Saw has all the capabilities of a normal table saw but its compact design means you can now take it with you and cut where you install. This saves you a huge amount of time that you would spend running back and forth to your table or miter saw. One downside is that it is a corded tool, so unlike other options here, you do have to work around an electrical cord. Skil have fitted the saw with an aluminum miter and rip fence which allows you to make miter, cross and rip cuts in all types of materials whether it be engineered wood, solid hardwood or laminate flooring. The tool features a 4.375” diameter blade and a miter gauge which has detents set at 0, 22.5 and 45-degree angles, allowing you to make a diverse range of accurate cuts. The flooring saw is lightweight at just 30 lbs and measures 28.9 inches in terms of length, 20.1 inches in width and 13 inches in height. It has a handle on one side which allows easy carrying. An attachable dust bag is also included which you can attach to the dust extraction port so as to reduce the amount of sawdust created and keep your workspace clean. Portable and saves a huge amount of time compared to a normal saw. Excellent for cutting a range of precise angles. Dust extraction port and attachable bag reduce the amount of mess created. Extraction port is compatible with ShopVac products. Best suited to cutting thinner board, cannot cut very wide boards. Adds an electrical cord to your workspace. Time-consuming to swap between ripping and crosscutting. Blade dulls after a few uses, be sure to purchase some extra blades. Could I run hardwood through this? Yes, it will cut through thin hardwood up to 3/4 inch thick. Is there a dust collection accessory? How much mess does this saw make? This comes with a dust bag, many do not find the dust bag very useful. The saw really doesn’t make that much mess in any case though. 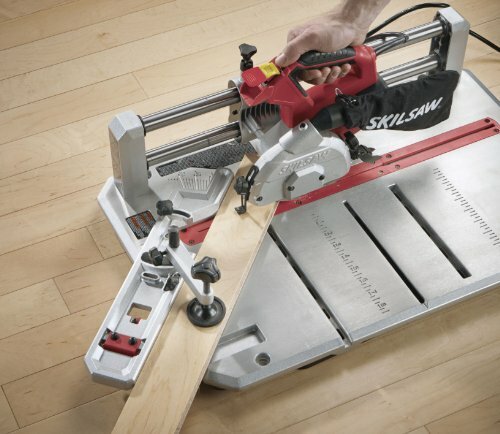 The SKIL 3601-02 Flooring Saw is one of the first truly portable table and miter saws. 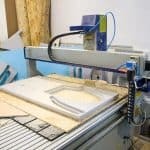 It has multiple advantages over some of the other products featured here in that you can cut precise angles and easily rip or cross cut boards. Swapping between different cuts can take some time and the blades are not the most durable. However, if you like using power tools and just wouldn’t have it any other way then Skil have created the best tool to cut laminate for you. This is the second Bullet Tools product to make our list of the top 5 best laminate floor cutters in 2018. 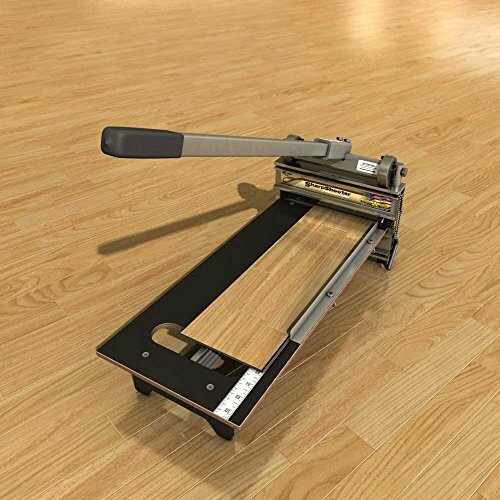 With its hefty price tag, the Magnum laminate flooring cutter is the premium option on our list. This an extremely versatile cutter with a generous cutting capacity of 13 inches in width and 1 full inch in thickness. Its compact design means you can cut right where you are laying the flooring, thereby expediting your job completion time. It also affords a very low noise level when being used so you can work anytime, day or night. This product does away with airborne dust and mess that may be a concern if you were using the Skil Flooring Saw. The heavy-duty Magnum is designed to cut engineered wood, laminate flooring, vinyl tile and other similar flooring types. This tool weighs in at 34 pounds and measures 24.2 inches in length, 15.8 inches in width and 8 inches in height. The Magnum shears are manufactured in the USA and comes with their Gold five-year warranty. Saves a huge amount of time by bringing the tool to the job. Strong build quality and extremely durable. Excellent cutting capability. Will cut cleanly through a three quarter inch piece of Oak. The handle doesn’t fold down which reduces portability. The blade could be harder. Can you buy the arm separately? Mine broke after 4 years. 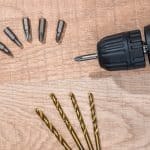 The tool comes with a 5 year warranty so you can get the replacement piece from Bullet Tools via the discount. You can also just order the part from them. How thick can this tool cut? The Magnum can cut up to a thickness of 1” once you remove the stop that keeps it at around 5/8”. 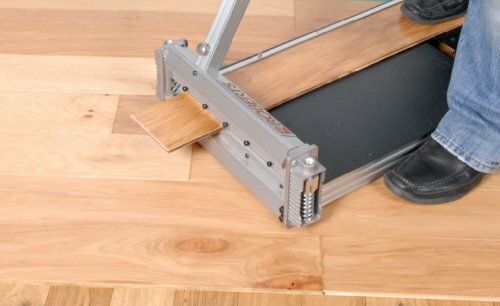 The Bullet Tools 13-inch MAGNUM Laminate Flooring Cutter is built like a tank. This heavy-duty tool will last a lifetime and is extremely capable of cutting even the thickest and toughest of flooring types. The Magnum saves you hours in the long run by placing the cutting task directly beside the laying task and minimizing dust creation and therefore reduces your clean-up time. This option is by far the most expensive and the weight combined with the un-foldable handle do make it one of the less portable options. If you aren’t concerned with your budget and are looking for the toughest, heavy duty flooring cutter that will last a lifetime, then this is the option for you. These are our top 5 picks for 2018. The best floor cutter for you will, however, depend on your specific needs and budget. Some will favor portability over functionality while others will simply want the longest lasting option. 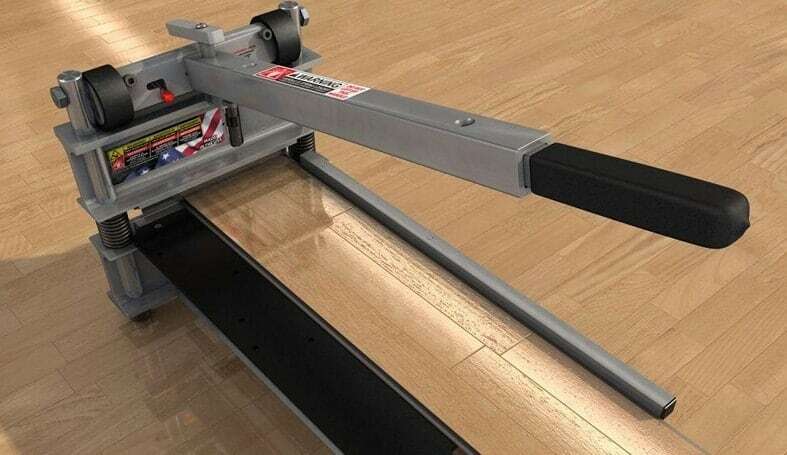 In terms of value for money, we believe that the Exchange-a-Blade 2100005 9-Inch Laminate Flooring Cutter takes the number 1 spot as the best laminate floor cutter around. Which means it gets our vote for a second year running. 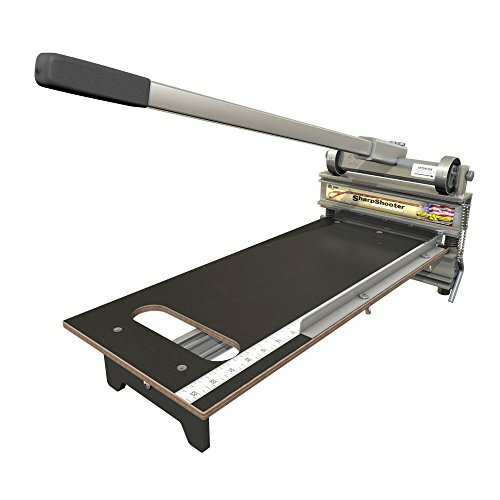 In 2018, this remains our top choice laminate cutter to buy.